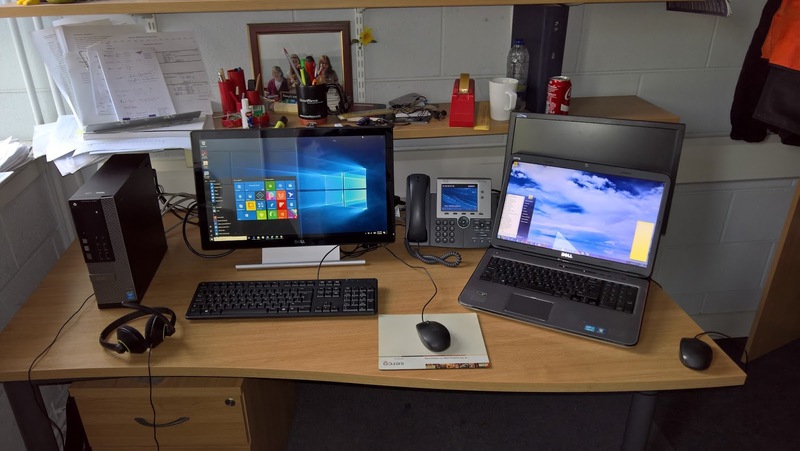 It's goodies time for me in NCI today as I have received a new desktop PC with a touchscreen monitor. I had decided that I no longer needed or wanted a laptop. The old one was very big and heavy, and I almost never took it out of the office. I never brought it home, nor did I ever bring it to classes or to meetings. In short - I did not need an expensive new laptop. My only luxury with the new (tower) desktop PC is that I requested (and got) a touchscreen. The 22" monitor is brilliantly clear and with Windows 10 I hope to make more use of touch. Most software that I need and use is already installed on the PC, the biggest piece of work is syncing accounts. Google Drive has to sync 81,901 files which will take a long time. I am holding on to the old laptop for a while to ensure that I match up all files and applications. I can remember the days when it took a long time to set up accounts and install software - it could easily use up a day or longer of work time. Within minutes of getting this new PC, I was able to get working again.